All lanes on the A27 Shoreham Flyover have been reopened following an earlier accident involving three vehicles. 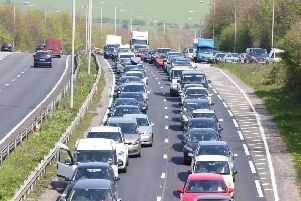 Traffic is still slow on the westbound carriageway between the Steyning turn off and the Sussex Pad traffic lights with congestion stretching to the Maudlin Lane junction and Shoreham Harbour turn off. The A27 Sompting Bypass has also been affected due to people slowing to look at the accident. The eastbound carriageway is partially blocked between Lyons Farm traffic lights and the Steyning turn off due to traffic congestion.